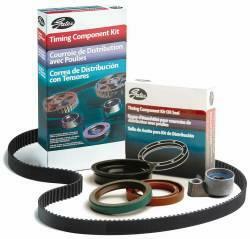 Gates Timing Component Seal - Dezod Motorsports Inc - Home of the automotive performance enthusiast since 2002. To help installers do a complete job of replacing the timing belt drive system, Gates has a line of cam and crankshaft oil seals. The seals will prevent oil contamination to a newly installed timing belt assembly, ensure maximum belt life and reduce costly “comebacks” that may result from future leaks at the cam and crankshaft. Gates engineers recommend that installers replace these oil seals whenever they install Timing Component Kits to ensure the best replacement service and maximum customer satisfaction.